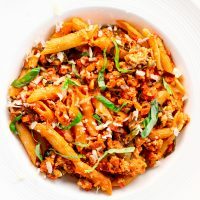 This Spicy Chicken Penne Pasta is made with ground chicken, garlic, onion, olives, and topped with lovely Parmigiano Reggiano cheese. It’s also loaded with fresh basil and mint leaves, and tossed in the most delectable spicy tomato cream sauce. Perfect for busy weeknights or a date night in! Combine all the spices in a small bowl. Cover with cling wrap and set aside. Chop the fresh ingredients: the garlic, red chilies, onion, black olives, the fresh basil leaves, and the mint leaves. Set aside. Rinse and drain the minced chicken. Set aside. Cook the pasta al dente according to package instructions in a large pot of salted water. Once cooked, drain and set aside. Heat olive oil, chili oil (if using), and unsalted butter in a large sauté pan over medium-high heat. Add the onion and garlic. Sauté until fragrant – about one minute. Add the red chilies and sauté for another minute. Add the minced chicken and cook for 3-4 minutes, breaking the lumps with your spatula/wooden spoon as you go, until cooked through. Pour in the canned chopped tomatoes and the cooking cream, mix to combine. Then add all the spices and seasonings in the small bowl you made earlier, as well as the sliced olives. Stir until combined and let cook for 2-3 minutes. Stir in the chopped fresh basil and mint leaves. Then, turn down the heat to medium and let simmer (uncovered) for 5-8 minutes or until the sauce and meat mixture has thickened slightly. Add the penne pasta to the pan and stir and toss to combine with everything, about 3-4 minutes. Turn off the stove and remove from heat. Transfer to a serving dish and top with the freshly grated Parmigiano Regianno Cheese. To Serve: Serve with extra cheese and additional crushed red pepper flakes if desired (optional). To make this gluten-free: Use a gluten-free pasta and cheese, and check the ingredients on the canned chopped tomatoes to make sure there aren’t any ingredients with gluten in it. To make this dairy-free: Omit the cream completely or substitute with almond milk. Also make sure to use a dairy-free cheese. To make this vegetarian: Use a soy-based ground product like Nutrela. Or use veggie sausage and break it up in the pan with your spatula, then add the tomatoes and cream. Feel free to halve the recipe: This recipe makes 4-6 servings, but feel free to halve it if you like.